Hello Frndzzz.... www.dealsnloot.com Again Back With New Ebay Loot Deals. Ebay offering 50% discount maximum Rs. 250 when pay using Oxigen wallet. 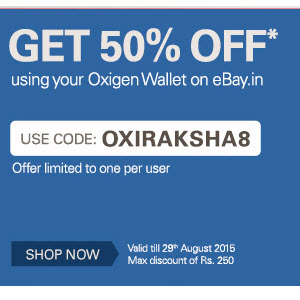 Oxigen Wallet let you instant money transfer, mobile recharges, bill payments and online shopping. Offer valid till 29th August 2015. Valid for 1 transaction. Note: Not valid on Deals and Discounted items or where you see Coupon not applicable in item listing.